Later that year David went to see the Open at Royal Birkdale, and after looking at the course plan he came up with the idea of writing a golf simulation on his Spectrum. By early autumn the game was finished and he decided to try and sell it to a software company local to his home. He had Ocean and Imagine to choose between, and after being told to ‘put it in the post to us’ by Imagine, went for Ocean. ‘I’ll be the first to admit that I’m not a programmer, and I know that when you reviewed it you didn’t exactly rave about it — but it’s still selling,’ David chuckled. Ocean’s Dave Ward asked his new programmer to go away and come up with a loading screen for Royal Birkdale, while the rights to use the name of the Golf Course were being sorted out, and he was so impressed by the end result that Mr Thorpe was asked to do more loading screens for Ocean’s games. 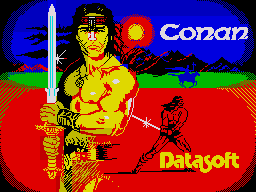 During 1984 David worked part-time designing loading screens for Ocean, and is the man behind the loading screens for Decathlon, Raid Over Moscow, Conan, Zaxxon, and Up n’Down to name but a few. With a number of published loading screens behind him, David went to the PCW Show and handed his card out to software companies producing games for the Spectrum. The response was good — and a fortnight later he had a call from Thames TV who asked him to submit a title animation for their new programme 4 Computer Buffs. He didn’t realise that it was really a competition at first, but set to work with Paul Owens, a programmer from Ocean who wrote the code to animate his graphics. If you happened to have been watching Channel 4 on 4th March this year you will have seen the end result! So how does he go about producing a loading screen? ‘Generally I’m given some artwork to work from — I owe a lot to Bob Wakelin who does Ocean’s cassette inlays — and then I set about translating the design onto the screen. Taking the original picture I draw it in pencil onto a printed grid of the Spectrum display area and then work from that using Melbourne Draw. While he is now working for six or seven software companies, all is not loading screens! David has begun to accept commissions for games screens and for animation sequences. Understandably, this aspect of his work is a bit hush-hush — games producers don’t want details of their forthcoming software splashed around our On the Cover feature — but this is an area of work that David hopes to develop. Working from a brief he designs characters as required and then works out a smooth animation sequence for them. ‘If it’s not a fantasy subject, I’ll look at photos and drawings done from life and get a mental picture of my subject. Then I work out the details on paper, starting with one view and building up from there. The next stage is to refine the sequence on the screen,’ David explained. Six months into his new career David is full of enthusiasm and has got to the point where the work is coming in at a rate where he is seriously thinking about employing someone to help him. ‘I’m quietly confident now I’ve been going for six months: I’ve never had a piece of work rejected and still enjoy the challenge of doing my best with the possibilities offered by the Spectrum, which are fairly limiting. It is a challenge, but you can get a reasonable drawing out of the Spectrum. On the Commodore for instance the graphics tend to be chunky and zig-zags tend to crop up on curved lines. ‘It needs a lot of patience and a kind of discipline to produce loading screens, but both my architectural training and my background in architectural drawings have been a great help. ‘I enjoy working as the artistic interface between people like Bob Wakelin and the computer screen, translating their work into the medium of computer memory — and animations and the problems of converting pictures for the screen allow me to incorporate my own ideas.